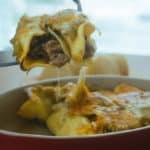 You probably thought it was impossible, and you probably still think it is, but give this Keto Enchilada recipe a try before you continue to have your doubts. We PROMISE you'll be brought back to your pre-keto, Mexican-eating days. The video below shows you step-by-step how to make them, but don't play it safe. Throw in your own twists with different fillings and toppings! Making Enchiladas Should be Fun! Cook and brown the meat. Fill the wraps with the meat and cheese, and any additional fillings. Roll up the enchiladas and place into a casserole dish. Top with sauce and more cheese, and place in the oven! You don't need six family members to make these, but you get the gist. You can involve everyone, keto or not, to help cook and it will make it a more enjoyable experience! Now, for the hard decisions... What goes in these enchiladas? 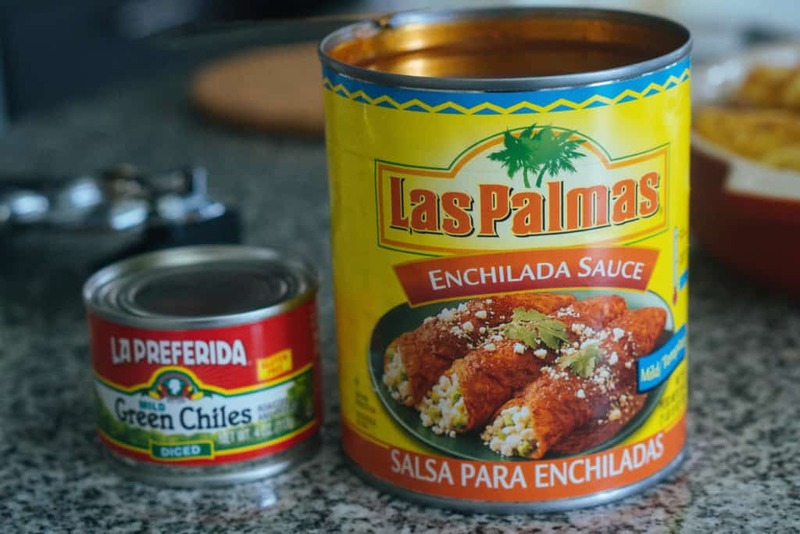 For sauces, we like two options: canned enchilada sauce or canned green chilies. Both are decently low in carbs and packed with flavor. You can even go wild and use both! That's what we like to do. The other two important ingredients, meat and cheese, are something you can play around with. Maybe you can do half chicken and half beef, and then we suggest you mix up the cheese for some maximum flavor. They even sell the Mexican four cheese packs, pre-shredded, in the grocery store, if you're at a loss for what to get! Enchiladas are one of the meals we miss the most. 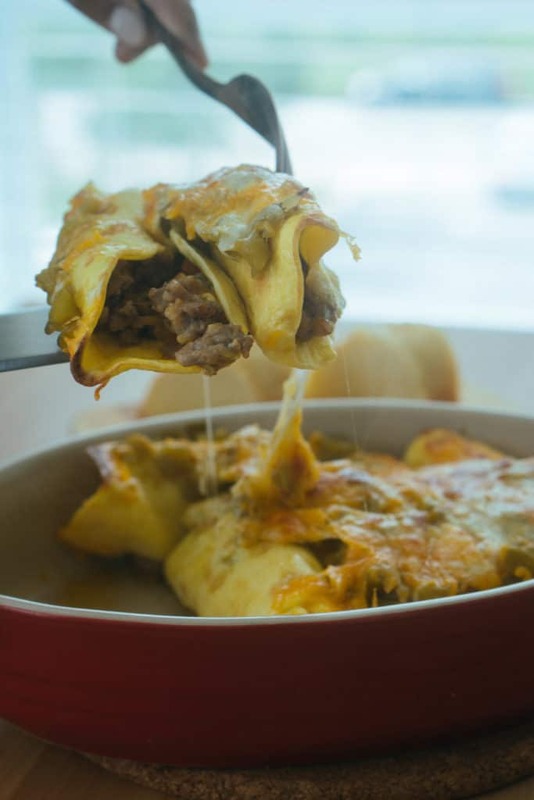 You can pack them with delicious ingredients and then top then with even more delicious ingredients without feeling bad, because that's how enchiladas should be eaten. This isn't an easy enchilada recipe by any means, but if you're a Mexican food lover like us, then you'll become a convert. You can officially have your cake (low-carb enchiladas) and eat it too (low-carb style)! When you make these delicious, low-carb enchiladas, make sure to go all out with the fillings and toppings. But, a big tip is to check the nutrition labels of any enchilada sauces you buy. A lot of canned, store-bought sauces can have sneaky, added sugars. You could even try your hand at a homemade sauce, if time permits. Either way you make these Keto Enchiladas, make sure you take a picture and tag us on Instagram to show us your yummy work of art! 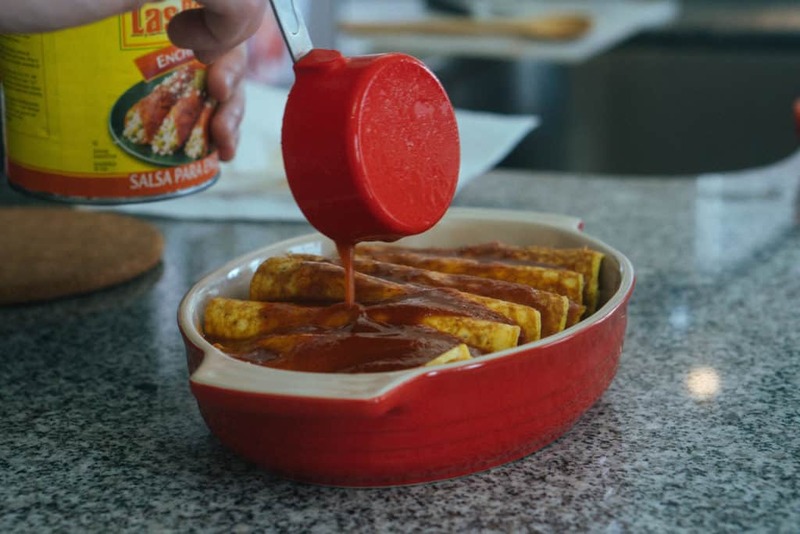 Recipe can be quickly added to MyFitnessPal - Search "KetoConnect - Breakfast Enchiladas"
Add all the ingredients to a large mixing bowl and whisk to combine. Heat a small (6 inch) skillet to medium-low heat and grease with coconut oil spray. Use a 1/4 measuring cup to pour the batter into the heated pan and cover with a lid to cook through for 2-3 minutes. Repeat process until all tortillas are cooked (we made 7). Turn the heat up to medium-high and add the ground sausage. Break apart into crumbles until it cooks through completely. 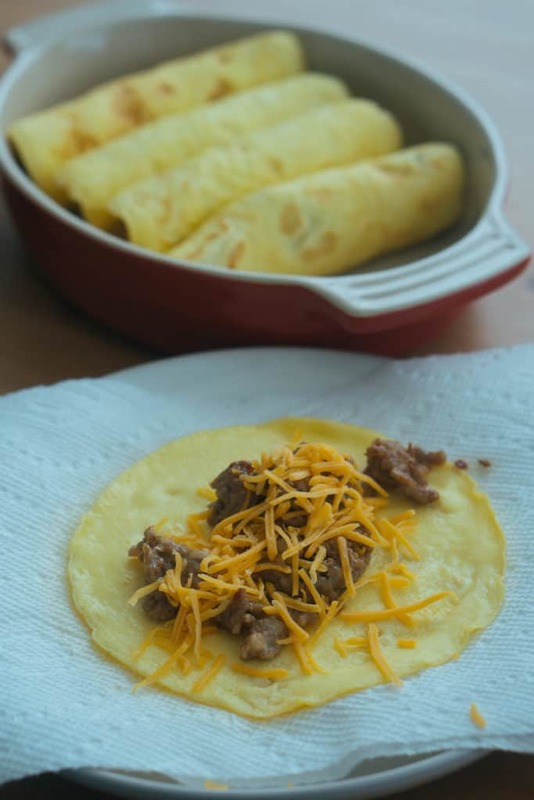 Make your enchiladas: Place some meat and cheese into each wrap. Wrap loosely and place into the casserole dish. Repeat until all enchiladas are in casserole dish. Top with enchilada sauce and additional cheese. Bake for 10-12 minutes until cheese is fully melted. Enjoy! Best stored in a sealed container in the fridge, up to 5 days.